→Cinchbucks Review – Get Paid For Doing Easy Tasks! Cinchbucks Review – Get Paid For Doing Easy Tasks! I recently came across Cinchbucks, another GPT site that provides many ways to earn money such as online surveys, cashback, and offers. In this review, I am going to explain how Cinchbucks works and give you my honest opinion about it. Can you trust this platform? Will you get paid? You may also want to check out the step-by-step training that helped me reach $1,000 per month from my laptop. Cinchbucks is known as a “get paid to” (GPT) platform where you can collect points for answering surveys, completing offers, watching videos, shopping and more. 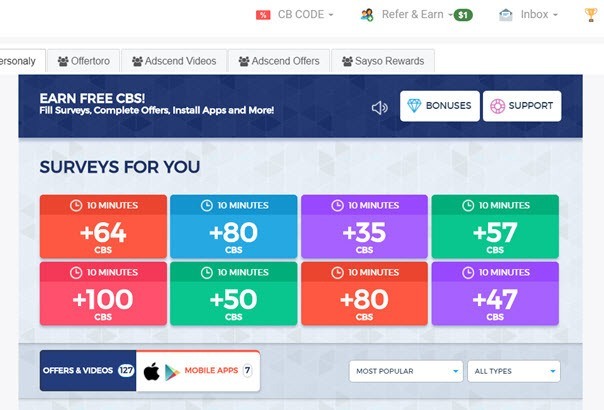 Once you reach the minimum requirement, you can redeem your CBs for cash or gift cards. Cinchbucks is available worldwide and works similarly to Swagbucks, Prizerebel (my #1 rated GPT), and dozens of other reward sites. They offer many opportunities to make money, but just like all GPT and survey sites, the pay rate is quite low. There are lots of surveys and offers available. There are many reward redemptions options, including PayPal and Amazon Gift cards. Cinchbucks has the right to terminate your account at any time, with or without reason. You will waste time trying to qualify for surveys. The sign up is free and straightforward. You just have to provide your email, chose a password and then click on the confirmation link sent to your email. They are currently offering a special promo code that you can use to earn 50 points (CBs) when you sign up. Speaking of points, let me explain how they work. Whenever you complete any activity within Cinchbucks, you will earn points called CBs. My advice is that you calculate how much money you are earning before you take a survey or complete an offer. That’s because sometimes the reward is so small that it’s not worth your time and effort. Once you reach 1000 CBs or $10, you can redeem via PayPal, Amazon, Visa Prepaid, and other various gift cards. An easy way to start collecting points is by completing the profile section. There are two profiling surveys worth 20 CBs each. 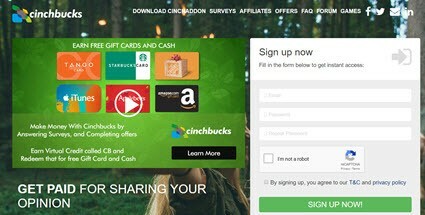 Cinchbucks has partnered with three reputable marketing research companies so you can get rewarded to share your opinions. 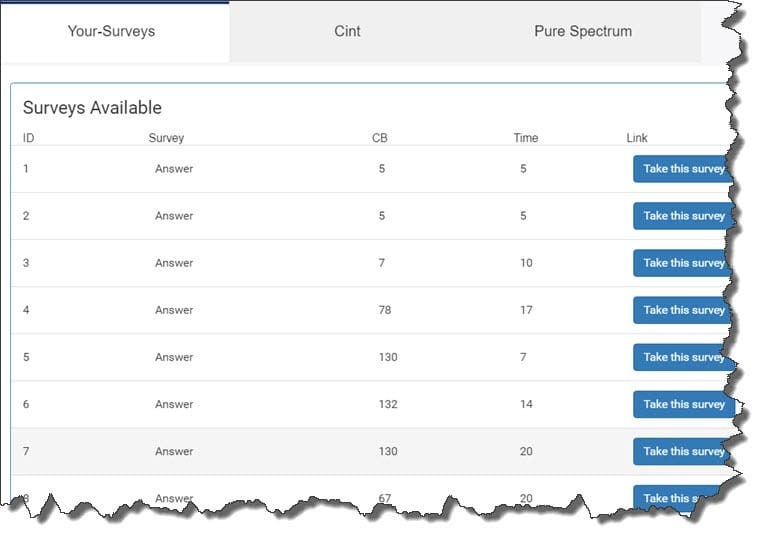 These are Cint, Your-Surveys and Pure Spectrum. You should always provide honest information and avoid rushing through the questions. I’m saying this because they have algorithms in place to detect contradictory and weak answers. People get banned if the company thinks their answers are not trustworthy. There are currently many surveys available in the UK. On my first day, I found over 50! Each survey will give you 5 – 300 CBs, depending on its length and complexity. Let’s not forget you will have to answer pre-qualifying questions, which can make you waste a lot of time. When it comes to offers, Cinchbucks connects you with a couple of third-party providers such as PeanutLabs, Trialpay, Personaly, Offertoro and more. I consider these Offerwalls as miniature versions of a GPT site, because most of them provide not only offers but also surveys, and other tasks. It’s important to understand that when you accept an offer, you become a potential customer to different companies. So, if you don’t want to spend any money, you should be careful with their terms and conditions, especially if the offer requires your credit card details. Also, if you don’t want to receive marketing calls and emails, you should avoid participating in prize draws and competitions. You can earn CBs in the form of cashback when you purchase different products through the Cinchbucks website. For example, you can purchase Amazon products and earn up to 5% cash back. Make sure are click the link within Cinchbucks’ site, which will direct you to the merchant’s site. Otherwise, they won’t be able to track your purchase, and you won’t get paid. Their cash back program is not as extensive compared to more established sites such as Top Cashback or Quidco. But still, it’s a great way to collect more CBs. Another way to earn CBs is by inviting other people to join Cinchbucks via your affiliate link. You will earn 10% of their earnings for life. You won’t earn much if you can only refer your family and friends, but there are other ways to promote your link. If you are interested in learning the strategy that I use to refer over 30 people per day and earn passive income online, check out this program. Overall, Cinchbucks is an excellent GPT site to make money online. It’s easy to use, trustworthy and full of opportunities. However, the pay rate is too low, and many people don’t feel motivated to keep doing surveys and other tasks in the long term. There are better alternatives to make money online. The method I use allows anyone to reach a full-time income from home. Keep reading to learn more about it! I used to spend a lot of time on survey sites, but about 3 years ago I discovered how to build an internet business and work for myself. The strategy revolves around setting up a website and ranking articles on Google. So, my job is to provide valuable content and promote products that I trust on my site. When people search online for a product review or another information, they find my site. Then, when someone clicks on my affiliate link to purchase products or sign up to other websites, I earn commissions. It’s not complicated, but I was only able to make this work thanks to this excellent step-by-step program. I started as a complete newbie, so I needed quality training and support to avoid wasting my time with useless strategies. Keep in mind this is not something that will happen overnight. It’s a long journey, but if you have the motivation to build a successful site and be your own boss, it’s worth the effort. Thanks for reading my Cinchbucks review. If you have any questions, please let me know in the comment section below.